Evidence suggests that eating blueberries, blackberries, strawberries and other berry fruits has beneficial effects on the brain and may help prevent age-related memory loss and other changes, scientists report. In a new review, Barbara Shukitt-Hale, Ph.D., and Marshall G. Miller point out that longer lifespans are raising concerns about the human toll and health care costs of treating Alzheimer's disease and other forms of mental decline . They explain that recent research increasingly shows that eating berry fruits can benefit the aging brain. To analyze the strength of the evidence about berry fruits, they extensively reviewed cellular, animal and human studies on the topic. Their review concluded that berry fruits help the brain stay healthy in several ways. Berry fruits contain high levels of antioxidants, compounds that protect cells from damage by harmful free radicals. The two also report that berry fruits change the way neurons in the brain communicate. These changes in signaling can prevent inflammation in the brain that contribute to neuronal damage and improve both motor control and cognition. 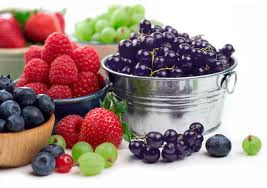 They suggest that further research will show whether these benefits are a result of individual compounds shared between berry fruits or whether the unique combinations of chemicals in each berry fruit simply have similar effects.